Mindwatch: Japan's PM a War Criminal? Japan's PM a War Criminal? Japanese Prime Minister Shinzō Abe is being labeled a "War Criminal" (戦犯 - link) for his belligerent efforts to re-militarize Japan. Why do local and international news reports feature one instance of disrespectful streetside graffiti from a rural Gifu parking lot? Should PM Abe be lumped as a Class A War Criminal with his infamous maternal grandfather, the Monster of Manchukuo Nobusuke Kishi? 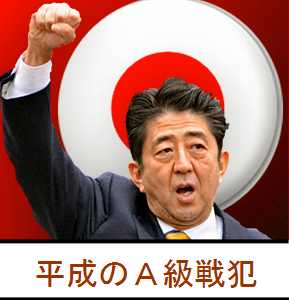 (Prime Minister Abe, 安倍晋三, is no known relation to Japanese convicted war criminal Hiroshi Abe - link). Both Kishi & Abe have ultimately served the interests of America's military -- (more than assisting Japan)? How Many Bureaucrats Fit on Your Bike?